Pearl Lake State Park is a destination as precious as its namesake. A 167-sq.-acre mountain reservoir, Pearl Lake sits at the base of Farwell Mountain nestled among a pine forest about 25 miles north of Steamboat Springs. 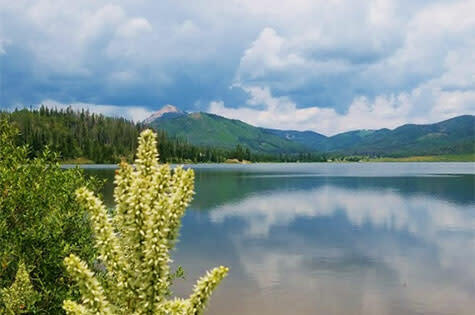 The quiet lake offers stunning scenery and natural surroundings ideal for a picnic or a camping getaway with easy access to the wealth of Routt National Forest hiking and biking trails. Anglers will feel at home among the cutthroat trout and grayling biting on flies and lures. Take a paddleboard or wakeless boat out on the glassy water and cast away. A campground features 38 sites and two yurts, offering a serene escape with lake and mountain vistas. The campsites are closed once the snow comes, but the two yurts can be reserved year round and provide a unique and remote backcountry escape accessible by skis, snowshoes or snowmobile. Amenities include water, boat ramp and trail access. Go west two miles on U.S. 40 to County Road 129, and then turn right. Go north 23 miles to Pearl Lake Road, turn right and drive the final two miles to the park.